Today we talk about 7ACRES’ offering of Jean Guy, a version which defines the upper ranges of price and performs similarly in quality. We touched on genetic lineage in yesterday’s Aphria Jean Guy review, we’ll hit the high points here. Jean Guy’s lineage is unknown, although a few resources attribute it as a White Widow phenotype. House of the Great Gardener carries a feminized version of Jean Guy and note the lineage as unknown. Not contested are Jean Guy’s origins in Montreal, where it was initially popularized. Edit: this Vice article by Simon Coutu was passed along to me, it gives a great detailed history of Jean-Guy Leblanc and notes it is certainly a phenotype of White Widow. I’ve written this review before a critical detail was brought to my attention. Thanks to the person who noted it to me, I completely missed it. 7ACRES lists this cultivar as a tribute to Jean Guy, leading me to believe it is not the actual Jean Guy. I am not certain of the actual lineage. 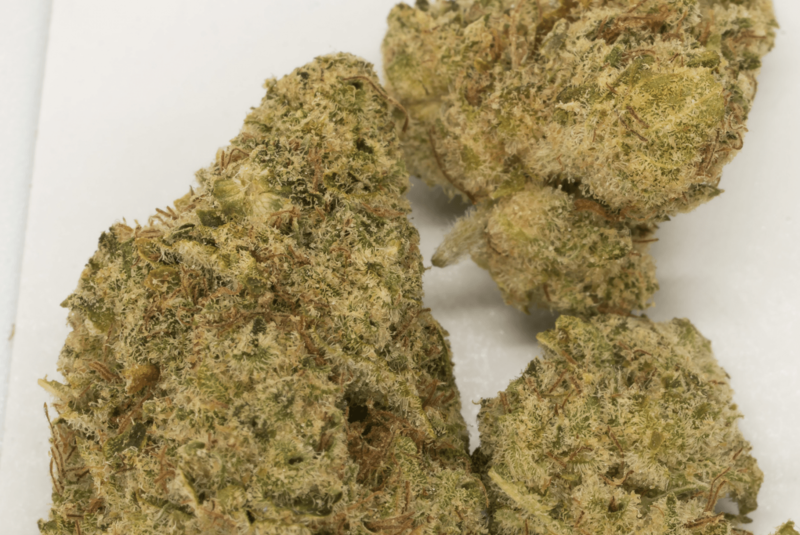 Expectations are high on this Jean Guy because of price point, $16 per gram, which is the maximum price per gram on the Alberta Cannabis website at the time of writing. The scent of the 7ACRES Jean Guy is a wonderful composition of citrus, spanning from sour to sweet notes. The profile shares some adjacencies with certain skunks, where the fruits linger above a reduced note of fuzzy musk and rotten egg, never prominent but always in the background. Jean Guy’s taste is similarly enticing, the crisp citrus greets before the congealed sweets lead to the musky reduction bordering the profile’s edges. With use in a vaporizer, the back end of the profile fades to reveal soft tone woods against the acidic fruit notes that display good longevity, both phases are enjoyable. This Guy’s visual appeal is well above average. Structure is great, I got one apical bud with two nicely trimmed lower buds. The manicure is meticulous, which I probably prefer, but I also don’t mind seeing a leafier trim. The buds have a density similar to the of the 7ACRES varieties I’ve seen, quite compact with little pliability. Grinds to a functional end product, not too dry, doesn’t stick together because the bud is too wet. Someone looked over every crevice of this Jean Guy with a sharp instrument, it’s observable. There is a level of quality assurance here that I don’t see in other brands of recreational cannabis. Over my past 2 purchases, four of ten varieties had good visual appeal, three of those were from 7ACRES. If 60% of my recent purchase history was regrettable, the consistency in the product really matters. Combustion was fairly clean, not outstanding, but still enjoyable, albeit with a muted profile. More than passable, not a defining experience. This is where I was going to jaw on and on about the differences in value between Aphria’s Jean Guy and 7ACRES’ Jean Guy. Aphria’s was $10/gram and was really poor quality. This 7ACRES variety was 55% more expensive ($16/gram) and was miles above the Aphria product in terms of quality. There is no contest between the two. I’d rather spend a bit more on a sure thing I use sparingly, then gamble on buying a container of shake for $10/gram. Next up, we’ll review the 7ACRES Wappa, which seems to maintain the 7ACRES quality we saw here, for less price. Afterwards, we’ll move to a variety that has similar visual appeal, priced under $10 per gram, and we’ll see how we feel about it in the wake of the 7ACRES products. You gotta do haven st. Mango kush next..its phenomenal. Thanks for the tip, Solace isn’t sold in my province yet but I’ll keep a lookout for it.